Producers are being advised to fill out and file a seven page self-assessable on-farm biosecurity plan in coming months. Cut through the acronyms and bureaucratic terminology in the new Johne’s rules and there is a simple, single message of which all cattle producers need to be aware. That is that they are being urged to fill out and file a seven-page, self-assessable, on-farm biosecurity plan in the next few months. From October 1, 2017, every beef cattle producer in Australia will need to have completed an on-farm biosecurity plan so they can remain Livestock Production Assurance (LPA) accredited beyond that date, and continue to have access to a full range of buyers. 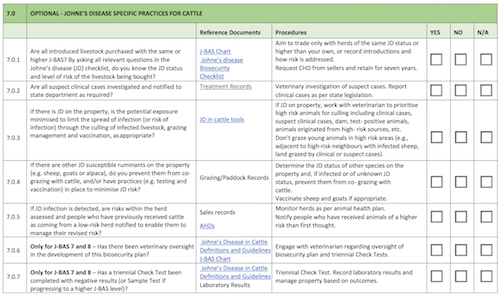 Under the new Johne’s management rules, only producers seeking to have a higher level of accreditation (ie JBAS score 7 or 8) will need to involve a veterinarian in helping them to complete their on-farm biosecurity plan. Producers content to maintain the default national score of JBAS 6 can fill out an on-farm biosecurity plan at home on their own and file it. They do not need to send it anywhere or formally submit it (more details on the new Johne’s rules here). From talks Beef Central has had in recent weeks with small and large cattle producers, stud breeders and buyers of cattle, it is clear that some see the new rules developed by Cattle Council of Australia as no big deal, while others are not happy. “We can’t get vets to preg test cattle and now we need more vets to run the BJD program,” one large producer with properties in WA and NT commented to Beef Central. Many ask why a disease of limited economic significance (see earlier MLA report) can be allowed to have such a significant bureaucratic impact on so many producers. And also why a large cattle producing State such as Queensland still does not have a biosecurity fund in place from which to compensate those impacted by disease management – or why such a fund is not implemented across the board Federally (a number of States currently have their own levy-funded biosecurity funds (more details in this earlier Beef Central story). Also, the new rules mean that decisions on how to handle Johne’s will now be up to individual producers on their farms. Remember the severe impact the owners of 177 quarantined properties endured from the Johne’s disease detection in Queensland in 2012-2013? Under the new arrangements, no quarantining will occur because regulation has been removed – the program is now market driven. Clearly not everyone likes the new rules and lobbying efforts against them continue. Whether those efforts bring further rule changes before the key 1 October 2017 date remains to be seen. But as the new rules currently stand, the main point producers need to be aware of is the advice to obtain by internet download, email or mail a seven-page biosecurity plan and to fill out out and file it. Producers with good online access can download the document from this link, producers needing a plan template emailed or mailed to them can contact a Livestock Biosecurity Network officer (contact details below this article). Rod Turner is an experienced livestock agent with Landmark at Roma who also has a cattle property in the district. He recently filled out the 7-page on-farm biosecurity plan for his property and said it was a relatively simple process. “It is not a weight to carry, and who knows, a little further down the track, maybe cattle will be going out of Roma Saleyards to the Northern Territory for live export. Australian Livestock and Property Agents Association chief executive officer Andy Madigan said the association’s view is that producers should have a biosecurity plan not only for JD, but also for the protection of their livestock and property from disease and weeds. “As part of the enhancements of LPA producers are going to have to do a biosecurity plan,” he said. “Some producers already have a plan on how they treat and introduce new livestock to their property for example but it’s not written down. By doing a plan for the Johne’s program, LPA’s on-farm planning requirement from 1 October will be covered, provided one of the recommended templates is used. How hard is it to fill out the form to get a JBAS 6? Check out this short (two minute) video from Pat Cleary and Dhugald McDowall at ECM Livestock from Moss Vale in NSW. They reckon it should take less than two stubbies, and in fact Dhugald knocks it over in less than one. Great use of technology to spread the word! I have been on the phone almost all day to the LPA, MLA head office and the victorian farmers federation and none of them can tell me where this $66 inc gst. is going and what its for. Got 3 answers, one it’s for your accredition fee two its admin fees and three its to pay to keep MY account in order. This is extortion no matter with way you look at it. they’ve got us by the balls and theres nothing we can do about it. They say you dont have to pay it, but you wont be able to buy or sell anything without it. Does anyone see anything wrong with this or is it just me and I need to willingly bend over? This is the opening to full control over our farms, to be told what to do and how to do it. They will deny this but you cant refuse them access. I also found out that the LPA is part of AUS MEAT which is a non goverment industry body we are forced to pay because “its good for the industry”. Just what this country needs, more regulations and control. The BJD fiasco is a manifestation of the structural weakness of Cattle Council. At a meeting with Barnaby Joyce in Brisbane a year or so back following the senate’s report, Jason Strong caused CCA to go to water when he accused the organisation of failing to manage its MOU with MLA to the detriment of beef industry levy payers. Now CCA expects to survive by receiving funding from the LPA fees of $60 a producer to commence from 1 October 2017. WE NEED CHANGE. I commend Wallace, Alf, Brad, Tom and Eion for their contributions to this debate. The feeling for change goes deeper than this. ABA have argued for change for years. The senate enquiry recommended changes. Joyce threatened action but failed to repair the damaged system. Our industry is strong enough to act without government support. We need to call a meeting to discuss these issues and decide how we can move forward with or without government support. Enough is enough. I was the first person to object to J BAS a couple of weeks before deregulation last year while I was on the Industry Advisary Committee. I argued that if it is there people will demand it as they have done,even though it has no merit ! The “A” in J BAS stands for ASSURANCE,there is no assurance in this system as there was none in a similar system used in the sheep industry that was abandoned after twelve years. I have never seen so much confusion in the beef industry in my entire life. CCA and AHA have done a shocking job in promoting a system that gives us no assurance against a disease of insignificance to the beef industry,well done to those on the gravy train. As for WA, J BAS 8 ? WA has acknowledged that 10% of their sheep flock is infected with JD where the Queensland flock has no known infection ? Add to this the known co grazing sheep and cattle in that state and no surveilance testing for 15 years who’s leg are they trying to pull ? How refreshing to hear such an experienced and highly respected cattleman put such a forceful and passionately presented position. Alf is a person who has embraced the use of data from a time before the digital revolution. Brahman Breedplan would not be what it is without his contributions, innovation and persistence. He has been ahead of the game for years and one should take notice of him. I think you miss the mark if you throw the word” unprofessional” in his direction. Australia’s beef industry leadership and institutions do not impress me and many I talk to share that position. Most put it in very frank stockcamp language. I resent having to put my money into the continuation of the current structures. To promote filling out a form and filing it as a basis for the allocation of a disease status is an interesting position. When you go through the links to the relevant codes, laws, regulations and policies the devil of the detail becomes a lot more clear. When you drink your stubby and fill out your form so quickly you definitely don’t have the full picture as it is in the plethora of stuff that underpins the summarised template form. When LPA was introduced we had to wear the costs of the bright ideas and its requirements have continued to grow. Now we are going to be required to pay to have a reduced period of accreditation. It’s a con just like the form one fills out and files which will protect us all from Johnes which it is pretty clear that is of such limited concern that the powers that be are really very happy to not have to be involved in its management. Let NT and especially WA test their cattle, sheep and birds, then talk to the major cattle producing areas about engaging in trade embargoes. Get a bit of substance to their lobbying, by extensive self testing in all of WA. No one has ever has yet, and along the arduous trail of dumb testing over 20 years good people have committed suicide, gone broke, or simply failed. Until those states step up and quit parroting discredited mantra from 20 years ago, let them test themselves into credibility. Try a credible trade embargo, if you feel you need one in WA. This present crap simply does not wash. This is no disease and is of no commercial or human significance. How loco is this misplaced program. Consign it to the dustbin of history where it belongs. I can vouch that the promoters of this dumb policy do not represent me. If this is the best they can do to represent folks in the cattle business, lie down in shame. Being a WA seedstock producer selling to all Australian states we have taken the required steps to achieve J-BAS 8. It wasn’t a big impost to do so as we already had a biosecurity plan like all proffessional beef produces should. The annoying part of this is the lack of information and communication on both the Johnes and LPA requirements. Surely every PIC number should have been sent notification of the requirements for both new systems. The other frustrating point is that we don’t have to submit our biosecurity plan to AHA (or someone) to validate our accreditation. J-BAS 7 & 8 requires a vet to sign off which provides some authenticity but J-BAS 6 requires you to shove it in the draw without scrutiny of how you answered the questions, you could answer no to every question and until you are LPA audited no one would know any different. So to Alf and Brad, I share some of you views particulary the fact that this plan has been developed by people with no vested interest in the industry, they can walk away from their job any time the heat gets too much but we can’t. But I disagree with your condemnation of the idea that our industry must become more proffessional at how it delivers product to the world, if you don’t like it get out but don’t be happy to put my beef business at risk by not wanting to be proffessional. By all means we need to take back control of how we develop the required systems but don’t bury your head in the sand as to the future. Simply astounding that strong minded cattlemen are bowing the knee to stupidity. The challenge should be that it not even be named “disease”. Johnes has no workable test. Johnes has no working effect in the major beef areas of the nation. Worse, it mutates across species of birds, sheep and cattle. If NT and WA think they have all under control, then we have nothing to lose by locking the gate at Camooweal, shipping every Qld brand through the Gulf and ports from Lucinda to Rockhampton. We know how to do this; just need common sense to prevail and a bit of backbone. Short term gains are well deserved by Kimberly and Topend cattlemen. Mid term gain will benefit everyone. So far we have been inundated by instruction from loads of agents and bureaucrats in Govt, agripolitics, and politics. No skin in the game, no capital in the game, and no downstream effect on them. Cattlemen need to call it like it is. Jumping at shadows has never served private enterprise well. When do we need to kow-tow to rubbish policies and dreamers? Alf Collins, CBV, Marlborough, Q. This is commercial blackmail, pay us $60 and we will let you trade. Of course filling out a form is easy it is implementing what the form dictates is the hard part. A $12 million take out of producers pockets over 3 years represents a 50 cent slaughter levy paid for by the producer absolutely scandalous.